This handsome, glossy-leaved orchid hails from low to mid elevation regions of South America. 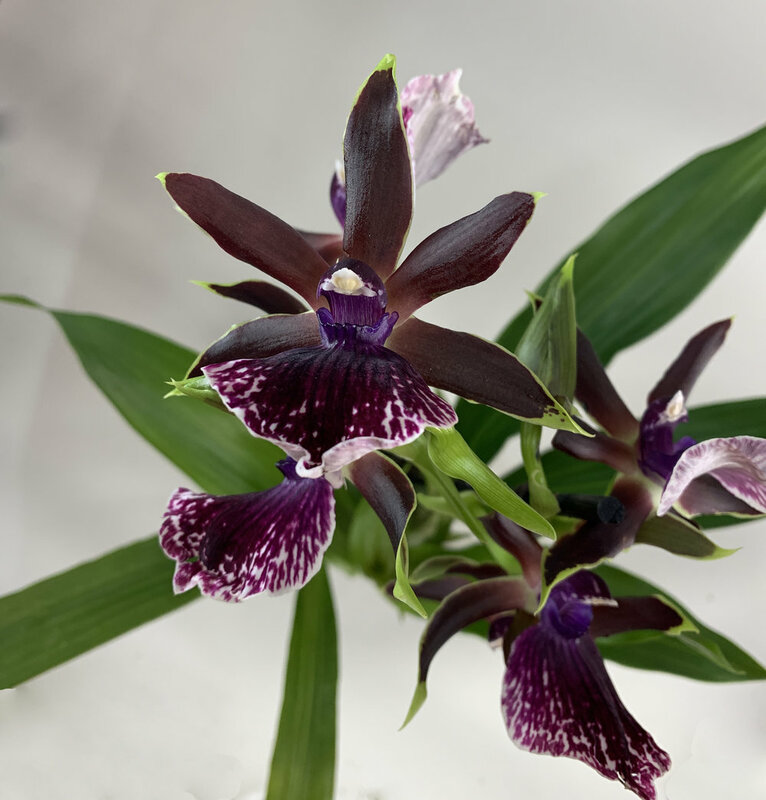 Of the 15 species of Zygopetalum, many are terrestrial. With multiple blooms that often in flower for 8 weeks, then make orchid's generic name is derived from the Greek term for "yoked petal", referring to the yoke-like growth at the base of the flower lip. LIGHT: Your Zygo enjoys the morning and afternoon sun but should be protected from hot midday sunlight. A light leaf with just a hint of yellow indicates that the plant is receiving the maximum amount of sun it can take; a dark green leaf indicates that it needs more sunlight. WATER: Watering of Zygo is a delicate balancing act. They shouldn't be allowed to go dry, yet they don't care for a soggy environment either. Watering once every seven to ten days is about right. As with everything else, special consideration must be given for the drying effects of varying ambient air temperature and humidity. TEMPERATURE: Zygo orchids will tolerate considerable summer heat as long as they have mild nighttime temperatures between 50-65 degrees F. Exposure to cold temperatures (down to 28 degrees F) for few hours each night will not damage an acclimatized plant, but once the plant spikes or flowers, it should be protected from temperatures below 35 degrees F. Always keep these plants free from frost.